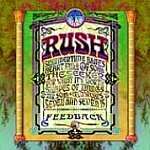 Review: "Rush: Feedback" - Sea of Tranquility - The Web Destination for Progressive Music! Astonishingly, Feedback marks the first time Rush has recorded a cover song of any kind since their B-side of Buddy Holly's "Not Fade Away" in 1973. Recorded strictly for fun, this nostalgia-centric helping of eight songs consists mostly of covers performed by Geddy & Alex, and Neil, in their respective pre-Rush bands in the late '60s/early '70s (several were also covered by the Lee-Lifeson-Rutsey incarnation of Rush). The renditions are faithful � very faithful, even meticulous � all the way down to Alex's gritty guitar tone (which he rediscovered in time for Vapor Trails). Well, this EP is a whole helluva lotta rockin' fun. With every song having landed in the Sixties, visions of (as Neil writes) incense, multihued rugs and lava lamps abound as the bare-bones assault of drums, guitar, bass and little else comes to the fore as Rush hadn't done for some time before 2002. The version of "Summertime Blues" here is a fusion of The Who's original and Blue Cheer's own revved-up take. The Yardbirds' "Heart Full Of Soul" and Neil Young's "Mr. Soul" sound great helmed by Geddy's voice � the latter would almost fit onto their last album were it not for that unmistakable melody and those distinctly un-Peart-like lyrics. Cream's "Crossroads" is tackled with much verve, thus ending the proceedings with a slam-dunk finish courtesy of Alex's jagged expression of Clapton's blues and Geddy's center-stage bass chops (though Gedd doesn't capture those throaty nuances Bruce's voice was known for). "The Seeker," "Seven And Seven Is" (arguably the best cover, after "Crossroads") and "Shapes Of Things" all make great driving (if not speeding) tunes. Considering the subject content of this release, one could say the boys from Toronto have wound themselves full circle all the way back to the first album; listen to Feedback, then throw on their debut! One gripe: the attractive gatefold format allows the CD to slide out a little too easily. The flipside is that Neil's liner notes and the marvelous band photo would have suffered in a standard digipak format with no additional booklet (that change would have only driven the price tag up, unnecessarily). Still, for eight or nine dolluhs, there isn't much to complain about here. Just a plain rockin' good time.